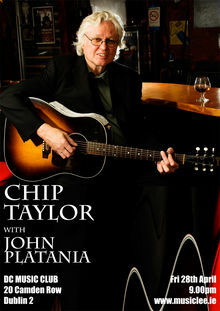 Chip Taylor was born Jamie Wesley Voight. He is the brother of actor Jon Voight and hence the uncle of Angelia Jolie and James Haven. Chip is best known as a songwriter having penned many hits for the likes of Janis Joplin, Aretha Franklin, Dusty Springfield and Frank Sinatra. "Wild Thing" and "Angel of the Morning" are his best known songs. Chip spent a substantial part of his life as as a professional gambler. His reputation as a “card counter” has resulted in being blacklisted from most of the casinos in Las Vegas where he is registered on their “face recognition” system. Chip Taylor is making some of the most distinctive acoustic music around today.” With the release of Little Brothers, a charming and intimate collection of new songs, and the EP I'll Carry For You (inspirational songs for the 2016 Rio Olympics) he continues to engage and delight music fans everywhere. Taylor has been involved in a series of amazing projects in the last several years. Norway’s premier folk singer, Paal Flaata, recorded a full album of Taylor songs, Wait By The Fire, and rode it to the Top 10 and a Norwegian Grammy nomination. He joined with Carrie Rodriguez for a reunion tour this past fall behind the 10th Anniversary deluxe reissue of their Red Dog Tracks album. The Grammy-nominated Yonkers NY (2009) shows his facility with storytelling within songs. A collaboration/duet with John Prine - 16 Angels Dancing "Cross the Moon - was the centerpiece of a special vinyl release for Record Store Day last year. And coming in 2017 is a book/CD, Son Of A Golf Pro, which combines the story of growing up on the golf course with often hilarious songs about the sport, and a deluxe reissue of his three 1970s Warner Bros albums (including Last Chance).